“If you are going to play the best you want them to be at their strongest,” insisted the Irish coach. 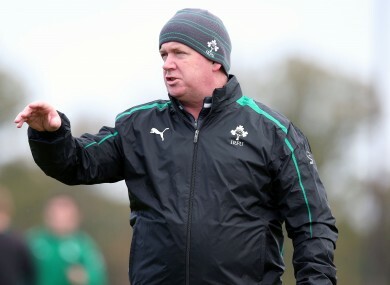 Declan Kidney has made seven changes to the Ireland team that lost 60-0 to New Zealand. THE TRAINING HAS been the best ever, there are a lot of leaders in the Ireland squad and the 60-0 reverse against the All Blacks was only a blip. Good, because I was starting to worry. When asked to weigh up the the upcoming battle between hookers Richardt and Adriaan Strauss on Saturday, Declan Kidney gives a literal answer with a dash of humour. Kidney’s remarks are best bracketed in the Graham Henry school of comedy but it is encouraging to see him try. He has made seven changes from the side that were tasered into early paralysis by the All Blacks at Waikato Stadium and there are some daring selections. New combinations, he admits, are risky but exciting. Great, because I was starting to worry. Kidney may never truly escape the accusation that he favours Munster players but he countered the promotion of Simon Zebo to fullback by making Leinster forward Jamie Heaslip his captain for the foreseeable future. “Simon has been playing well,” said Kidney. “I see the back three as somewhat of a reversal for the front row, just different ends of the pitch, they need to play off one another they just have a bigger area of ground to cover. We’re fortunate in that we have a number of candidates for it but I think that he has proven that (captaincy) sits easy on his shoulders at Leinster. The one thing with captaincy is that you don’t want to be burdening a player. Add Mike McCarthy’s ‘right place at the right time’ promotion to the second row and the chance given to Chris Henry to stake a claim for the openside flanker position – as well as Keith Earls at 13 – and there will be enough plots and sub-plots to push RTÉ towards red-button coverage. With Kidney revealing the grim task of assigning medical reports to assistant managers for the past five press briefings, Kevin McLaughlin and Eoin Reddan – not to mention in-form Paul Marshall – must consider themselves highly unfortunate to miss out on selection. Referring to the decision to drop McLaughlin from the matchday 23, Kidney said, “It’s a bit of Sod’s Law sometimes as you’ll have a clutter of guys going for the one position. It is pretty unusual that you’d have this many senior players out at the one time but it is always exciting to see new guys coming through and see what they add. Six is one of those. Springbok coach Heyneke Meyer has lamented the loss of his Japan-based players and injured stars like Bryan Habana but he has not fooled Kidney. “They’ve so much to choose from really,” he remarked. “It was just a matter of who was going to get on the pitch at any one time. “The one thing they’ve done is they’ve picked their strongest side. That is the best compliment you can have so we’re under no illusion of the size of the task we have. Email “Guinness Series: Kidney energised after throwing the selectorial dice”. Feedback on “Guinness Series: Kidney energised after throwing the selectorial dice”.